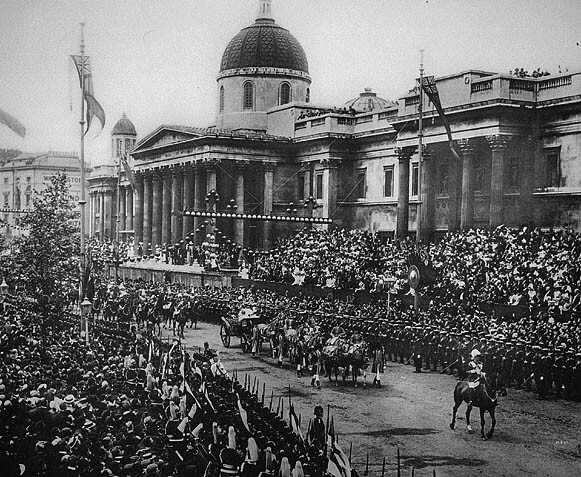 When Queen Victoria celebrated her Diamond Jubilee in 1897 marking 60 years on the throne, the British Empire was at its zenith with their influence spread across both hemispheres. Despite the fact their "colonies" across the Atlantic had broken away more than a century before, the phrase "the sun never sets on the British Empire" was still a truism. Over the course of the 19th century, America expanded ever westward to the Pacific Ocean. California's heritage was deeply rooted in the fertile soil of a more southerly exposure. The Latin legacy that had been more easily accepted in the 1800s by those making their way to the sun and health of Southern California, was much less attractive to those arriving at the dawn of the 20th century. Developers of the time became convinced that Great Britain could offer that relatable sense of history that to their mind was lacking in Los Angeles and one that might be more attractive to the new arrivals from the east. Oxford Square's name was part of that process, as was Wellington Square further to the south. 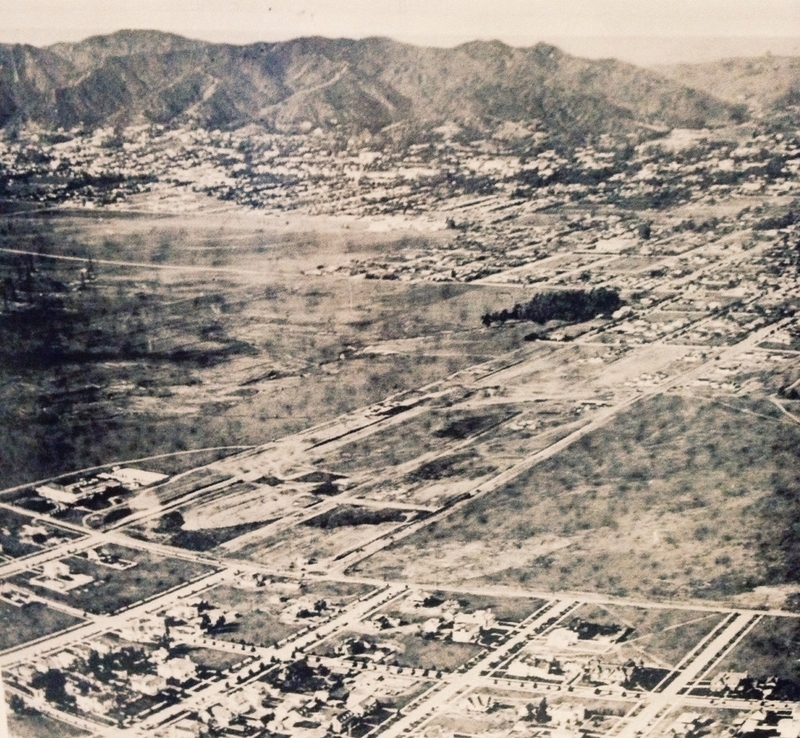 Windsor Square, yet another very English name, was chosen to define properties sold north of Wilshire, which as the time was still an unpaved dirt wagon route. That northern area came to be considered the most prestigious of the many new real estate developments that were quickly expanding across Los Angeles. Street names that criss-crossed those neighborhoods took on a more desirous mantle than the streets further south. In an attempt to stitch the city together and link the disparate developments, some of the streets in West Adams were changed to match those to the north and vice versa. QUEEN VICTORIA'S JUBILIEE, circa 1897. When West Adams was fist being settled, some considered the location too distant from the city center, where the grand Victorian homes clustered on Bunker Hill. In 1896, the city of Las Angeles officially expanded with its western & southern addition annexation, which incorporated the Victorians that had been built along Pearl/Figueroa, Grand and East Adams. It was the introduction of the streetcar that was paramount to the growth and expansion of Los Angeles, as the young city began spreading further outward from its downtown core at the beginning of the 20th century. Oxford Square was first laid out in 1907 by Emil Firth, a Bohemian immigrant, who came to America in 1874. 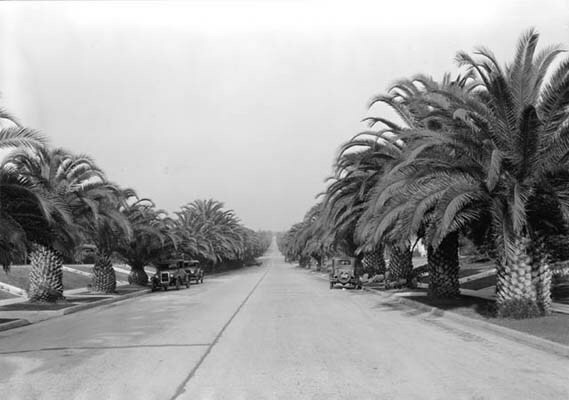 YOUNG CANARY ISLAND DATE PALM TREES WERE USED TO LINE THE STREETS OF OXFORD SQUARE, circa 1931. 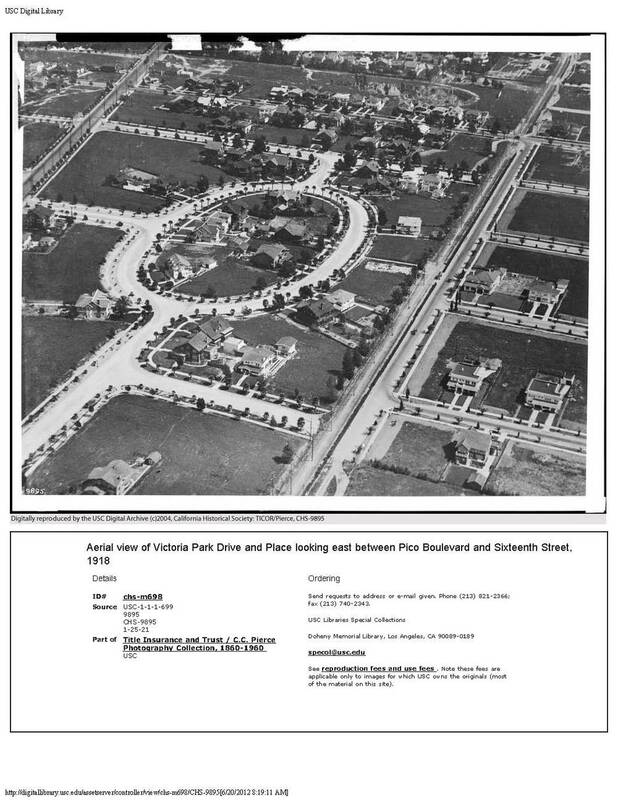 Creating wide avenues and large lots, Firth advertised Oxford Spare as a "refined and aristocratic" area and promoted the inclusion of modern conveniences such as ornamental "electroliers" and "wide concrete walks, combination curbs, gutters, and oil tamped streets... all completed and of the very best quality. The prices for these beautiful lots range from $1000 up and terms are extremely easy". ADVERTISEMENT FOR OXFORD SQUARE, Los Angeles Times May 9, 1909. 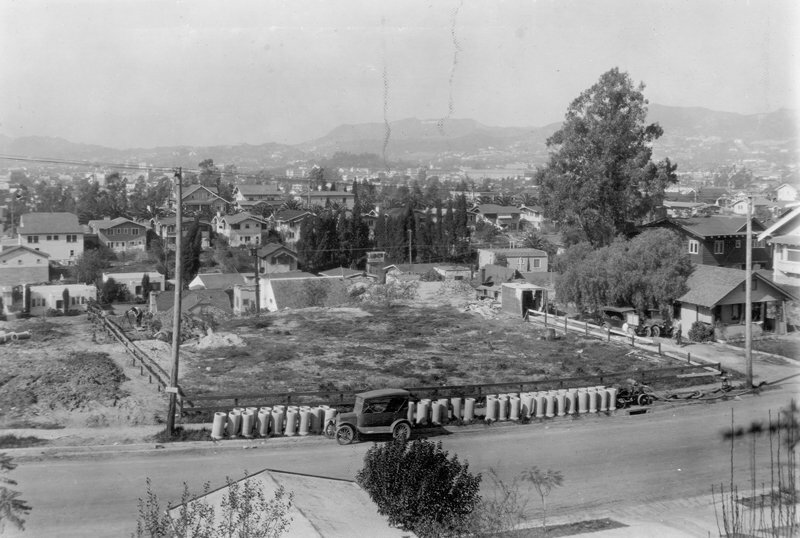 The development that Firth laid out stretched from north Pico to almost Wilshire Blvd. 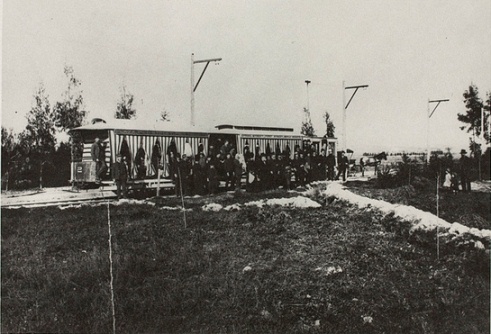 Today we are visiting the southernmost area where many of the earlier homes were built in this new tract, due to their proximity to the Pico Heights Electric Railway. At the beginning of the 20th century, this area had already developed a sense of affluence due to the Los Angeles Country Club in 1899 from near the Rosedale Cemetery to the corner of Western and Pico. This 107 acre site, known at the time as the Pico & Western Links, offered an elegant clubhouse and an 18-hole course that was the very expression of a "gentleman's pastime". Golf was an extremely popular sport at the time and available only to the very privileged. By 1905 "The Links" were relocated yet again, this time further west into Beverly Hills. Eventually this acreage evolved into the residential area we now refer to as Country Club Park. The establishment of the Harvard Military Academy at the corner of Western and 16th St. (now Venice) was another draw. Marketed by Grenville Emery as offering "a superior education for the sons of Los Angeles Society". This new institution, which is now known as the prestigious Harvard Westlake School, opened its doors in 1900 to serve a growing and affluent urban population. To see one of the first printed advertisement for the academy please click here. During the first ten years several grand residences were built in the Arts & Crafts style, taking advantage of the views afforded by the knoll on which they were built. Firth insisted that the houses constructed in Oxford Square were set well back from the street and walkways with their garages only at the back of the property. The population boom of the 1920s further expanded Los Angeles with more farmland purchased by developers, some of whom were Irish and British immigrants and who chose names for streets and neighborhoods that reminded them of home. Building styles evolved to include many more modest Craftsman homes along with the introduction of "Period Revival" styles that had already been popular on the east coast and were strongly influenced by the new movie industry that was taking root in Hollywood. One significant impact to Oxford Square occurred when 10th St. was widened to provide a grand cross-town approach to Memorial Coliseum, built in 1923, just to the south of downtown. Renamed Olympic Blvd in celebration of Los Angeles' hosting the 1932 Olympics. This wide boulevard separated the original Oxford Square into two distinct neighborhoods, Oxford Square and Windsor Village. Meanwhile the building boom continued and by 1940 the infill was complete. The area remains virtually unchanged to this day. West Boulevard & Sherman Dr. Bridge,looking east over Venice Boulevard. Sherman Dr. Bridge was later renamed to West Boulevard Bridge. (circa October 01, 1928).